I put a movie on for the girls so I could make dinner the other night. I turned around and saw Avery laying on Jaeden, both of them so into the movie. I thought it was so sweet so I had to take a picture. So cute! It's so fun to watch siblings loving one another! SOO cute! I love getting pictures like this of the kids. They're priceless. 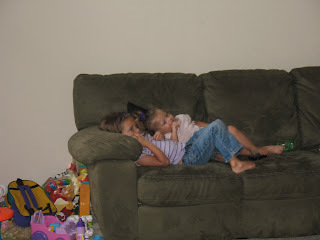 There is something so "proud mommy moment" about your kids getting along and loving eachother!! So good job on being a GREAT mom!! When are you comming here again I miss you!! That is sooooo dang cute! I love you couch, I think that we have the same one. You also have some really cute kids. so sweet that they are kind to eachother~just goes to show they have a great mommy! !